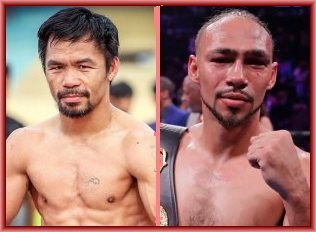 PhilBoxing.com >> News >> List of Articles >> Recah Trinidad: Would Thurman be ready for Sen. Pacquiao? Would Thurman be ready for Sen. Pacquiao? MANNY Pacquiao said he should be fighting again in May, but did not name a possible next opponent. His camp loved to say that everybody is now interested in fighting Pacquiao. The 40-year-old fighting senator, severely bothered by flu, still managed to deliver an exciting unanimous decision victory over the boisterous and aimless Adrien Broner in Las Vegas on Jan 19. Pacquiao returned home quietly after disposing of Broner and was next seen in Hong Kong where he rested and watched his son play basketball. In a chat with local media in his senate office on Wednesday, Pacquiao said he’s leaving the choice of his next foe to the Premier Boxing Champions (PBC) of the powerful and influential Al Haymon. Actually, Pacquiao’s attention was roused after Keith Thurman, the WBA super welterweight champion, called out his name following an underwhelming performance in Brooklyn, New York last weekend. Thurman, 29-0, returning from a 22-month lay-off caused by hand and elbow injuries, was upbeat and said he would be ready to fight Pacquiao anywhere. There was no direct response from Pacquiao, but Freddie Roach said he would prefer Thurman for Pacquiao’s next foe if they can’t get Floyd Mayweather Jr. The 30-year-old Thurman barely managed to save his crown against Josesito Lopez, a 30-1 underdog. Thurman did knock down Lopez with a plain left snap in the second round. Lopez however wobbled Thurman in the seventh round, and nearly succeeded in finishing off the faded, retreating WBA super welterweight champ. Some rust, but still managed a win, said Thurman, looking pleased with himself. Objectively, there was nothing to be glad about Thurman’s performance. Anywhere, anytime, Thurman said, but legendary fight promoter Bob Arum said Thurman’s time appeared over. “I don’t think Keith Thurman can fight anymore. I thought he was awful,“ Arum remarked. Meanwhile, Jeff Horn, who has again expressed desire to fight Pacquiao, has been turned down. Once belittled by Thurman, Horn said there was nothing to be worried about Thurman now. “I think Thurman’s last fight was sloppy, there was a lot of rust to be taken out,” Horn said. Thurman, irrevocably diminished, would need a longer rehabilitation in order to return to decent fighting form. One year can’t be enough.